A photographer friend of mine is on the trip and wanted to snap a photo of this sketch. I thought I'd post it since it's all nice and digitized for me. 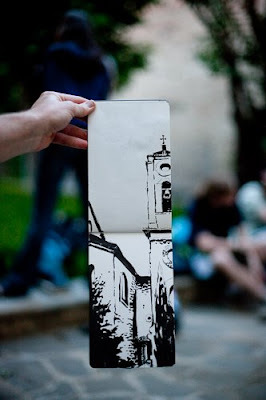 Nice sketch, and for that matter, nice hand gesture. Hope you are eating lots of pasta. Wow! That hand looks realistic! Well done! hey lets see some more! Great composition. Way to make the most of your materials. Also, I can't wait for the huge post when you get home. B&W is your thang. Not to say color and texture etc arent. Your brain is just wired in beautiful unique ways. Check it out, Brother Wyatt! You're talented in Italy too! Awesome. Literally, I'm in awe. Some. anxiously awaiting your SUPER POST!!! i hear you're back in town- welcome!! we should plan a get together on the 4th with the strongs and peep's! catching up is a must! !